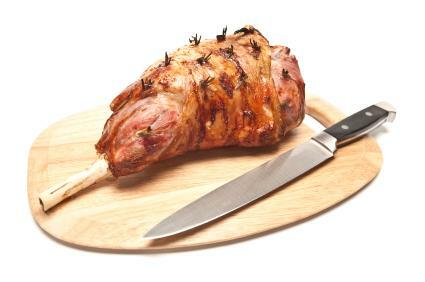 Lamb has a delicate, natural flavor and is equally mouth-watering grilled or roasted. Whether you choose a boneless leg of lamb recipe to cook on the barbecue or a bone-in version to roast in your oven, be prepared for an elegant entrée that will dazzle your dinner guests and having them begging for your cooking secrets. Years ago, lamb got a bad reputation for being strongly flavored – and not in a good way. This was mainly due to mutton being marketed and sold as lamb. To earn the label of true lamb and impart the preferred light flavor most people enjoy, the animal cannot be more than a year old. Be careful not to overcook the lamb. Overcooking your lamb will dry it out and kill the flavor of the meat. For medium to medium-rare lamb, the internal temperature measured by an instant read thermometer should be between 120F and 145F degrees at the thickest part of the leg. A five pound leg of lamb serves between six and eight people and a six to seven pound leg around 10 to 12 people, with boneless varieties yielding a bit more meat per pound. The charred exterior that a charcoal or gas grill gives a leg of lamb accents the soft, moist interior. Place the marinade ingredients into a blender or food processor container and blend until smooth. Lay the leg flat on a counter and trim it of excess fat. Make vertical cuts in the thicker parts of the leg and flatten the leg until its shape and thickness are as uniform as possible. You will not be able to make the thickness the same for the entire leg, which is fine because this will give your dinner guests the option to choose their lamb in differing stages of doneness. Rub the marinade on all surfaces of the lamb, being sure to get it into all the cuts and crannies. Place the leg into a large plastic freezer bag or other container and let it marinate for several hours, preferably overnight. Remove the meat from the refrigerator two to three hours before cooking. For charcoal grilling, build a medium-hot fire using long-burning hard charcoal. For gas grilling, preheat the covered unit on medium-high for thirty minutes. Cook for 15 to 20 minutes per side until an instant read thermometer indicates the preferred internal temperature has been reached. Let the leg of lamb rest for five to ten minutes before serving. If the weather outside is not conducive to barbecuing, or you just long for the aroma of roasting lamb and herbs wafting through your home, try this recipe. Prepare the same marinade used for the grilled leg of lamb. Trim the excess fat from the leg of lamb, leaving a very thin layer intact to keep in moisture and seal in juices as the lamb roasts. Rub the marinade all over the leg, place it into an airtight container and refrigerate it for several hours or overnight, removing it several hours before starting the roasting process. Place the oven rack in the center position and preheat the oven to 475F degrees. Position the leg of lamb in the center of a shallow roasting pan large enough to comfortably hold it. Pour any marinade from the container over the meat. Place the pan into the preheated oven and cook for 20 minutes. Lower the heat to 350F degrees and cook for an hour. After an hour, check the meat’s internal temperature and remove it from the oven when cooked to your level of preference. Let it rest for 15 to 20 minutes before slicing it into serving pieces. While the lamb rests, pour the accumulated fat into a saucepan and place it over medium heat on top of the stove. Add two cups of chicken stock or chicken stock mixed with equal parts of white wine and boil until slightly thickened, scraping up solids from the bottom of the pan. Season the sauce with salt and pepper and serve it alongside the lamb. Unlike many meats, lamb can be successfully carved from any angle without compromising the tenderness of the flesh. The meat is so young and tender, cutting with the grain has no adverse effect on it. Lamb is traditionally served in very thin slices rather than hefty chunks.